Auction Listings in Illinois - Online Auction Auctions - Ben Ladage Auction Inc. Comic Book Auction #4 ! Huge ! Ben Ladage Auctions Inc.Terms & ConditionsWe do everything possible to make our auctions fair and transparent.1. Before bidding on-site, online or by proxy at Ben Ladage Auction Inc. auctions, you must read and accept the Terms and Conditions of Bidding. Read these terms carefully. When you sign your Bidder Registration Agreement, bid live at auction or click the "accept" button online, you enter into a binding legal agreement with Ben Ladage Auctions.2. Payment for Ben Ladage Auctions are cash, a good check with proper ID, and credit card. A transaction fee of 5% is applied for credit card processing. A returned check or not sufficient funds check will be charged $25 processing fee. 3. All bids submitted to Ben Ladage Auctions are final and irrevocable, whether they are submitted in person, online or by proxy. If you are the highest bidder and the auctioneer announces the lot as sold to you, you are the new owner of that item. All sales are final.4. Ben Ladage Auction sells each and every item "as is, where is." We make no representations or warranties with respect to the items in our auctions. 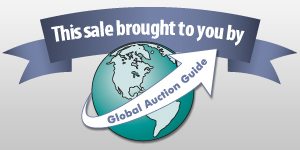 We recommend that you visit the auction site to inspect any items you'd like to buy before bidding on auction day. You may also send someone to the site to conduct the inspection on your behalf.5. Ben Ladage Auctions expressly forbids owners and their agents from bidding on any item they have consigned to an auction. This applies to on-site, online and proxy bidding.6. Every item becomes the responsibility of the new owner as soon as the auctioneer announces that an item has been sold. If you are the highest bidder, you are responsible for insuring your purchase immediately.7. Registration to bid is free. Ben Ladage Auctions reserves the right to refuse the issuing of a bidding card. 8. A 10% administrative fee (or listed as BP) on all online purchasesA. This administrative fee applies to on-site, online and proxy purchases. B. This administrative fee will be waived for purchases made in person at our auctions.9. Buyers cannot take possession of or remove their purchases from the auction site until the total purchase price (including applicable taxes or fees) has been paid in full. Purchases must be removed from the site by the time specified in the auction catalogue or on the auction details page on this website.10. Shipping is provided by Ben Ladage Auctions. Upon completion of auction Ben Ladage Auctions will box and weigh items to be shipped and delivered. It is up to the bidder (auction winner) to pay for the shipping of items. 11. To bid in this auction on-line you will need to register with a valid credit card via our secure Auction Flex registration gateway. Credit card is the default payment method. Payment will be deducted from your credit card 72 hours after invoicing if payment by alternative method has not been made12. Ben Ladage Auctions Inc. are not responsilble for any human or computer errors.13. All announcements made on sale day shall supersede any prior advertisements. Items sold as is where is with no guarantee unless otherwise stated prior. Announcement:Information contained herein is presented on behalf of the seller. Ben Ladage Auction Inc., agent for the seller, cannot guarantee the information to be correct or assume the liabilities for errors and omissions. All lines drawn on maps are approximate. Buyers should verify the information to their own satisfaction. Any announcements made from the auction block on day of auction will take precedence over any matter of print and will be final.